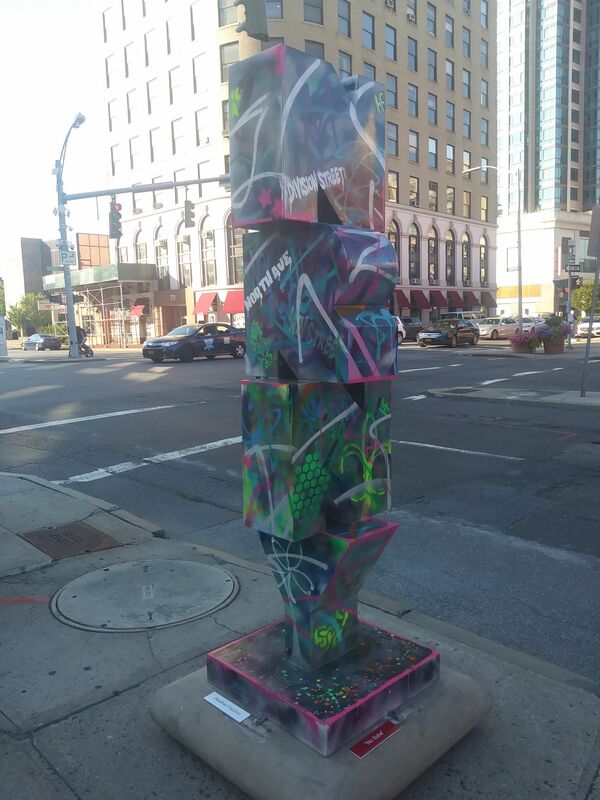 In the downtown heart of New Rochelle, NY, several pieces of artwork are popping up, courtesy of local artists. Many of them celebrate the history of the area. This one, by Charles Fazzino, celebrates its history in the arts, and particularly shines the spotlight on Terry Toons, the animation studio that was located in New Rochelle from 1930 to 1971. They produced and created cartoons featuring dozens of popular characters, including Mighty Mouse. This particular one is about seven feet tall, made of the three-dimensional letters NRNY stacked atop each other. It gets plenty of foot traffic going by, being on a corner near the Metro North train station, Monroe College, and several large banks. In addition to the cartoons, you’ll see tributes to several celebrities as well. Just a few feet away you’ll find this more modern artwork.